The innovative GS-12 electric-powered mixer sits on the floor of a potable water storage tank, constantly circulating water to evenly distribute disinfectant and kill bacteria. The new SolarBee GS-12 high-volume submersible mixer thoroughly mixes potable water storage tanks of a wide size range, ensuring uniform distribution of disinfectant, preventing stratification and providing uniform water age. At 40 percent of the cost of comparable mixers, the electric-powered, low-voltage GS-12 mixer pulls water right off the tank floor for the most efficient mixing of important boundary layers. Measuring 36 inches long and 11.5 inches in diameter (91.5 cm long, 29.2 cm diameter), the SolarBee GS-12 is lowered through a 12-inch diameter or larger hatch. There is no need to enter or drain the tank. The unit’s low-impact feet and end-caps will not damage tank coatings during installation or operation. A ground-mounted control box includes optional SCADA outputs and is UL-listed. The GS-12 mixer is compatible with SolarBee’s optional Chlorine Boost and THM Removal Systems to ensure optimal water quality and to meet the upcoming EPA Stage 2 Disinfection Byproducts Rule. SolarBee’s BeeKeeper maintenance and service plan is available with the GS-12 mixer. SolarBee Inc., a division of Medora Environmental Inc., develops, installs and services long-distance water circulation equipment to help solve water-quality problems. 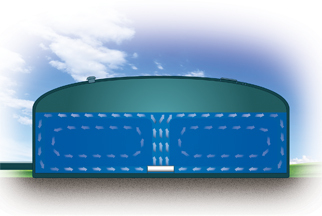 The award-winning and patented long-distance circulation technology has been successfully applied to prevent and control harmful blue-green algae in fresh water, reduce energy usage and control odors in wastewater, and to reduce nitrification, thermal stratification, and stagnation in potable water storage. 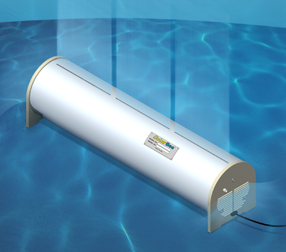 The floating long-distance circulators can move up to 10,000 gallons per minute from depths of more than 100 feet and have been proven in hundreds of applications worldwide. The new SolarBee GS-12 submersible mixer provides economical tank mixing for optimal water quality. The new SolarBee GS-12 electric-powered mixer creates water circulation that constantly replaces disinfectant and kills bacteria.